Last week I was the lucky winner of the JoJo Loves You Giveaway from Monograms and Martinis in Manhattan/Boston. I was very excited when the pink package from Boston arrived in the mail. These Bling earrings and Bling Bangle in Aqua will be put to good use, especially this summer on the Vineyard. I have posted my love for this line before and can thank KAG for introducing us to these amazing baubles seen all over Beantown. Her blog has been a long time favorite and it's been especially fun reading as she plans her upcoming nuptials. 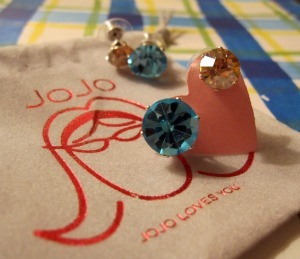 Her bridesmaids will be wearing earrings from JoJo. Earrings come in two sizes, Bling and Mini Bling, here you can see the size difference. Love them both! YAY!!! Winning giveaways is always so fun! Ahh, Congratulations! I am so jealous! They will look soo fabulous! Congrats! That is some purdy bling at that!